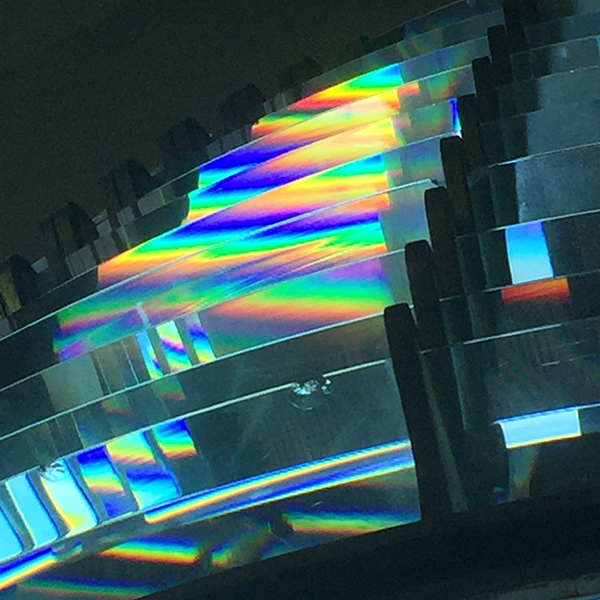 Over the last few years I’ve explored the color of light in all sorts of ways using computers, gels, prisms and LED’s. I’ve learned how to describe the same color in many different languages – Lab, RGB, Hex, CMYK, etc. 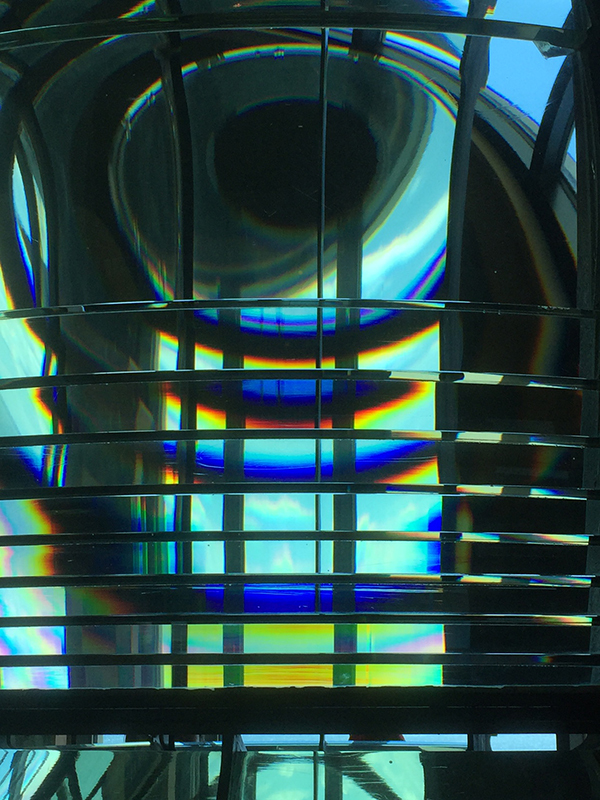 But none of that prepared me for the joy I felt this weekend seeing the colors of light broken by the lighthouse lens on display at the Cape Disappointment Lewis and Clark Interpretive Center. I just finished reading Astoria by Peter Starke. 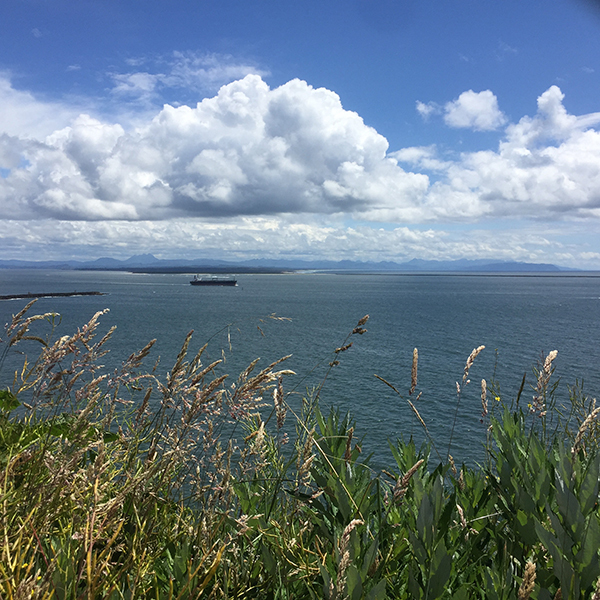 Its the fascinating story of John Jacob Astor’s failed attempt to establish a global fur trading post at the mouth of the Columbia River in the early 1800’s. 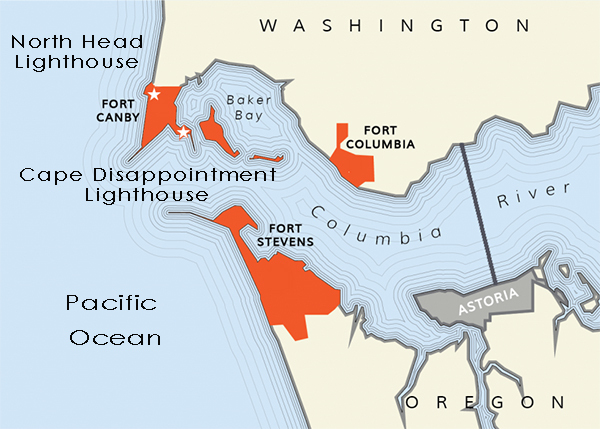 Starke paints a clear picture of the hardships endured by the two parties sent by Astor to plant the American flag on what is now the northwest coast of the USA. One party went by land. One party went by sea. They suffered extreme hardships, both physically and mentally. In the end they gave up the whole enterprise. It was an eye-opening little bit of history of the place that I live; the Pacific Northwest. I wanted to see some of the places so vividly described in the book so on Saturday we took a day trip to Astoria. 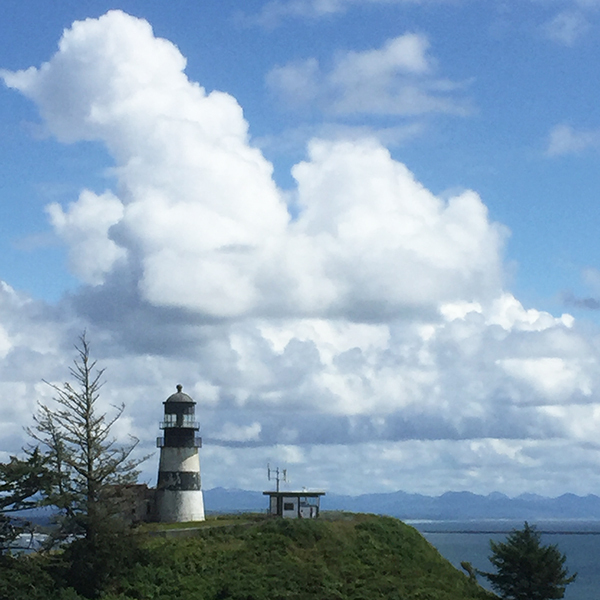 After wandering around the present day town for a few hours, my husband and I decided to cross the bridge into Washington to visit the two lighthouses on Cape Disappointment. The hike in to the North Head Lighthouse was fairly easy. 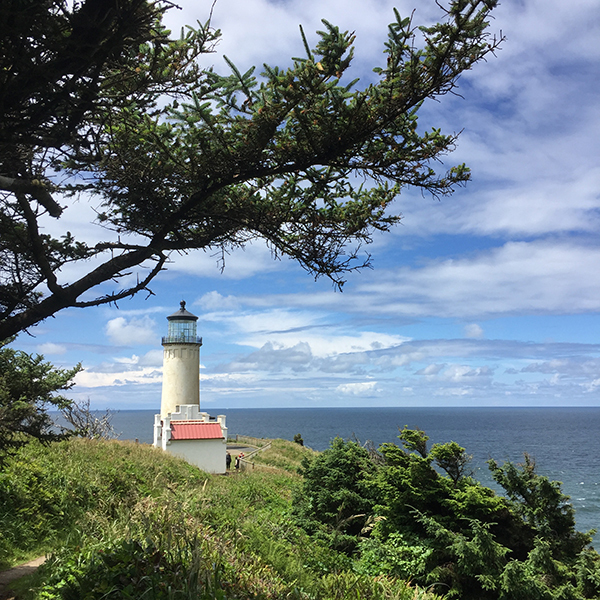 The hike to the Cape Disappointment lighthouse was a bit longer and steeper. The wide view across the treacherous Columbia River bar – one the most dangerous ocean to river crossings in the world – was well worth the hike. Before heading home we popped in for a quick visit to the Lewis and Clark Interpretive Center. 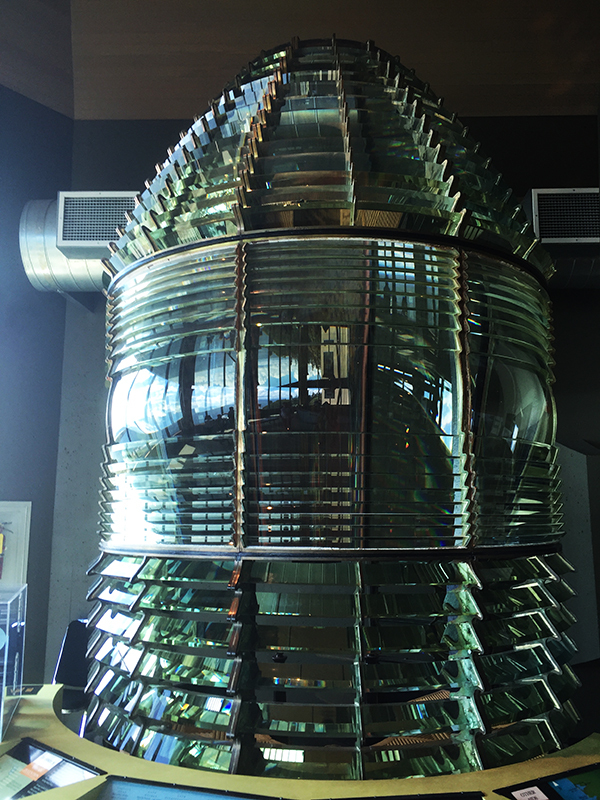 That’s where I found the lighthouse lens. 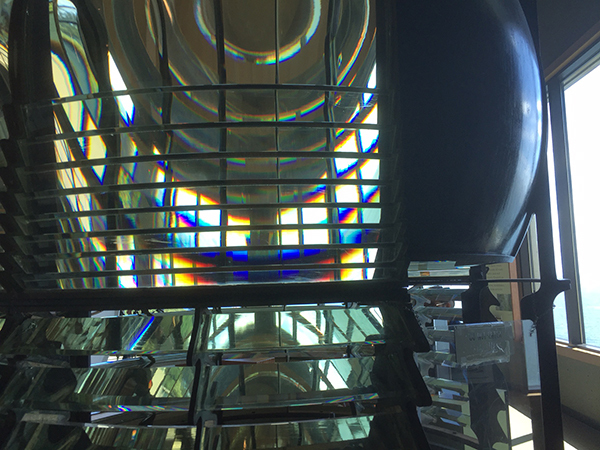 According to Aaron Webster, manager of the Interpretive Center, the lens is a first-order Fresnal style lens built by the French company Sautter in the early 1800’s. 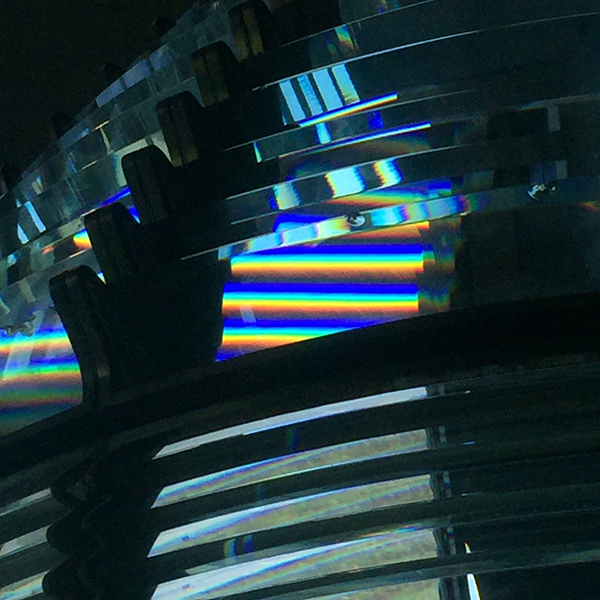 The lens was specifically made for use in the Cape Disappointment lighthouse. 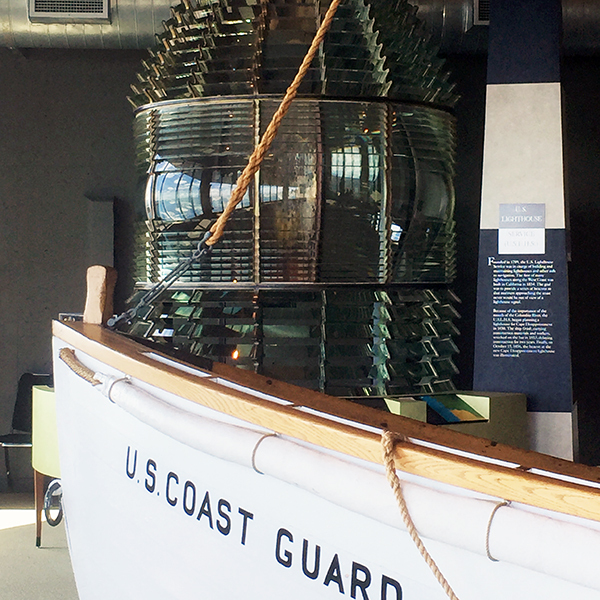 It was installed in 1856, moved to North Head lighthouse in 1879, and found its home in the Interpretive Center in 1975. 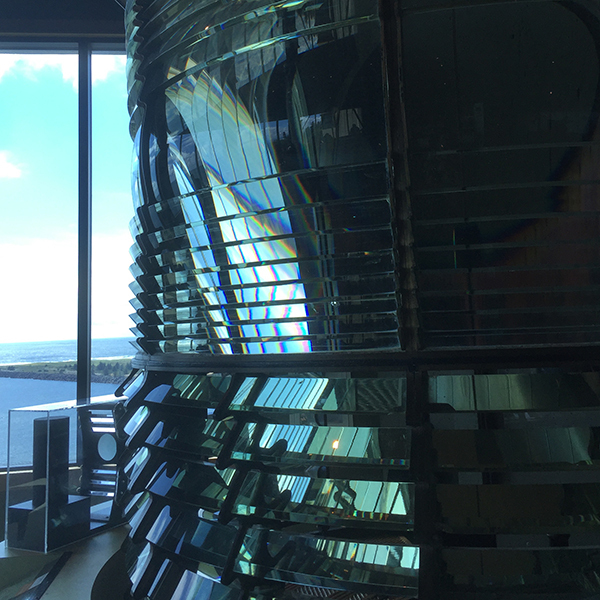 Doesn’t it remind you of a huge glass version of R2D2 or maybe a bristling Dalek from Dr. Who? When I got around to the far side, I noticed colors breaking on the lenses. They pretty much stopped me in my tracks. 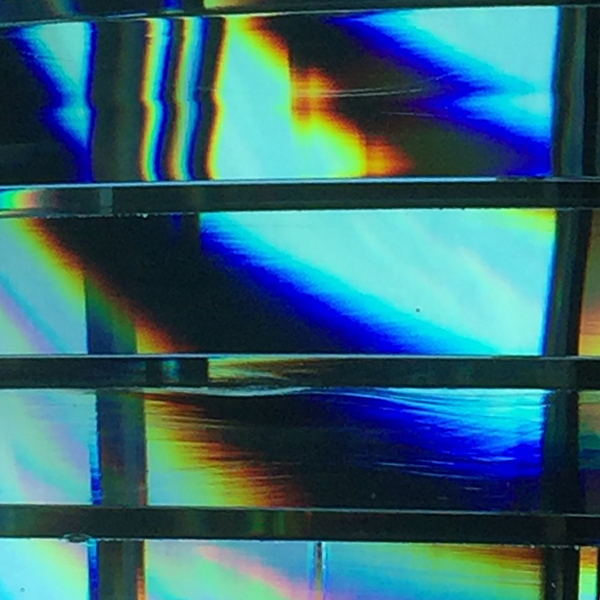 I’ve spent years doing prism exercises with my students but this was a prism on steroids! Every time I moved an inch the colors shifted. I spent the next thirty minutes trying to capture the colors with my Iphone. Here are just a few of the photos I took. They have been resized but not retouched in any way. The photo above is one of my favorites. It clearly shows all the rainbow colors plus it shows the colors that we won’t see in the rainbow – the purples and magentas that appear when the red and blue ends of the visible spectrum overlap. Gorgeous! Researching the optical characteristics of the lens, I discovered a new word. Collimate. 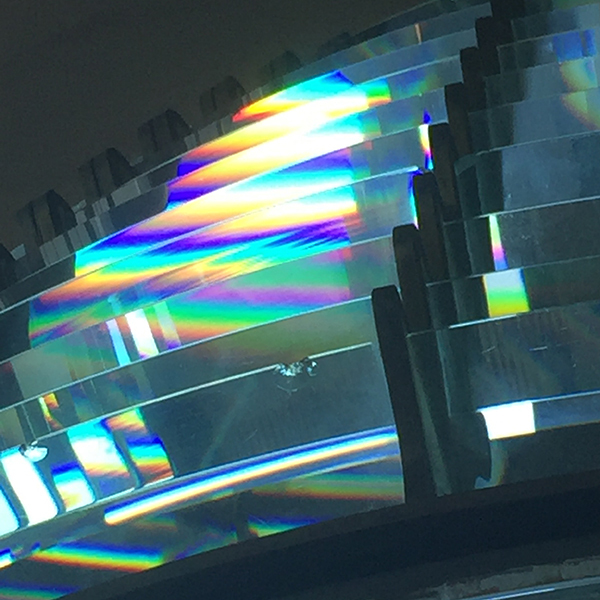 The Fresnal lens is designed to collimate the light of the lamp. From Wikipedia: Collimated light is light whose rays are parallel, and therefore will spread minimally as it propagates. A perfectly collimated beam, with no divergence, would not disperse with distance. 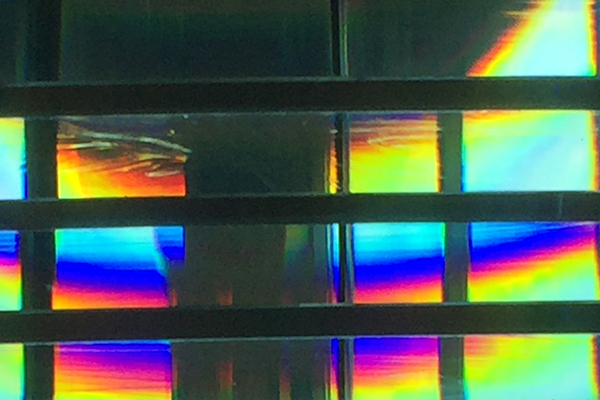 Such a beam cannot be created due to diffraction. 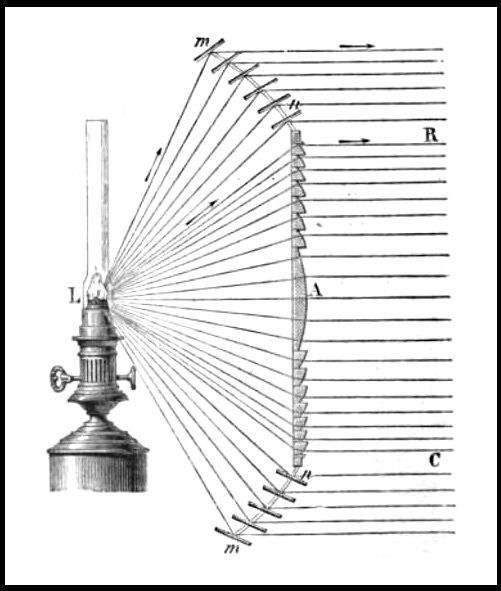 Light can be approximately collimated by a number of processes, for instance by means of a collimator. 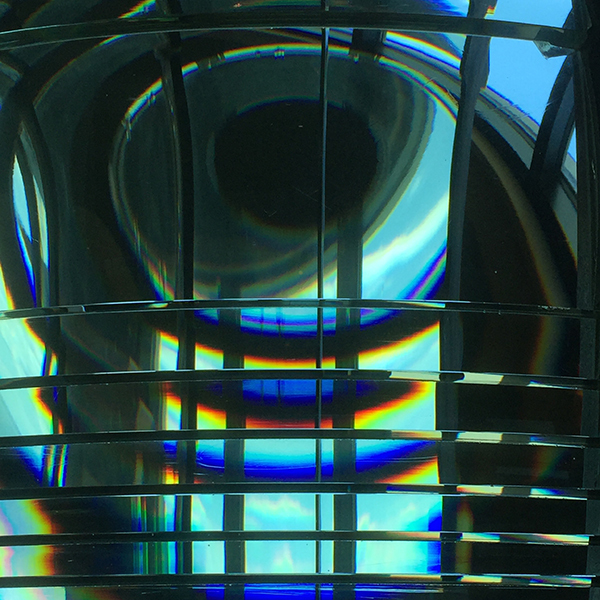 Perfectly collimated light is sometimes said to be focused at infinity. Thus as the distance from a point source increases, the spherical wavefront become flatter and closer to plane waves, which are perfectly collimated. 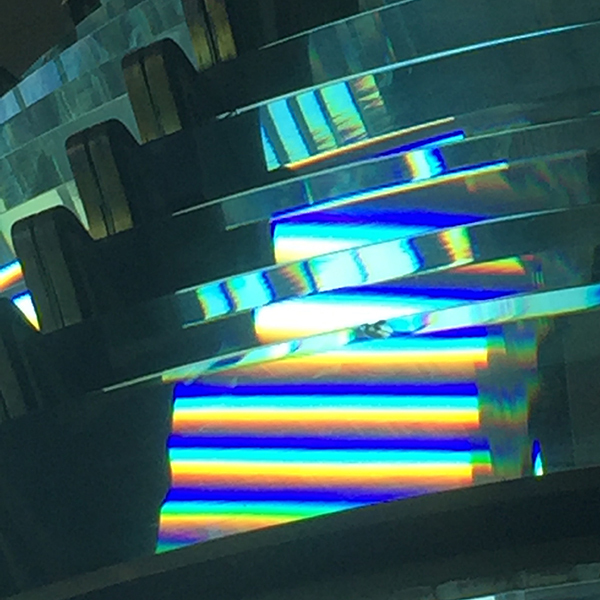 The staff at the Interpretive Center said that in the winter, when the sun is lower in the sky, the light passing from the window through the lens turns the ceiling above their welcome desk into a swirl of color. Now that would be a sight to see!